Now this is MY KIND of ice cream! After making two wonderful (but not up my personal alley) batches of ice cream for Michael, I finally made some for ME*! *Ok...it's for both of us. I'm still nice, I share. 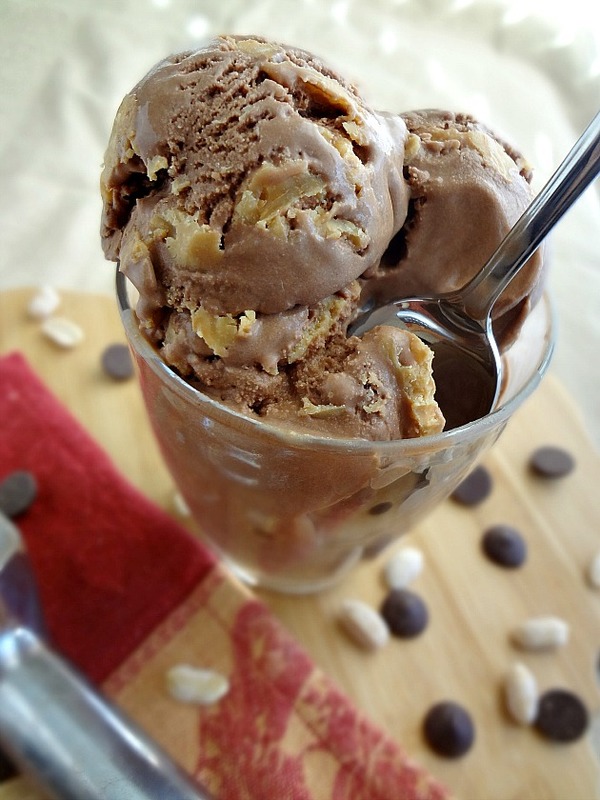 My current favorite ice cream flavor (aside from Jeni's Salty Caramel), that I order when I go to most places, is dark chocolate with peanut butter swirl. I need the chocolate to be chocolatey (none of that sub-par, barely chocolatey ice cream for me!) 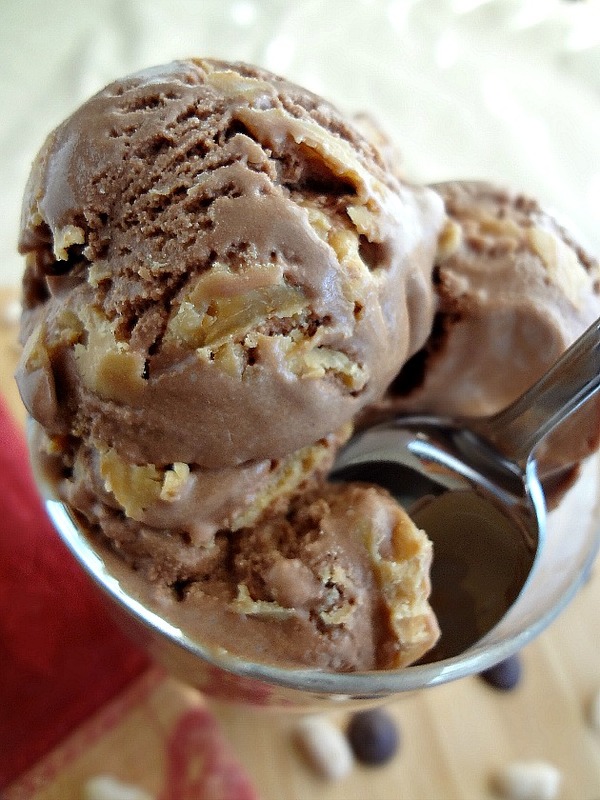 and I need the pb swirl to be nutty and gratuitous--no skimping on the peanut butter!!! This recipe is everything I want! 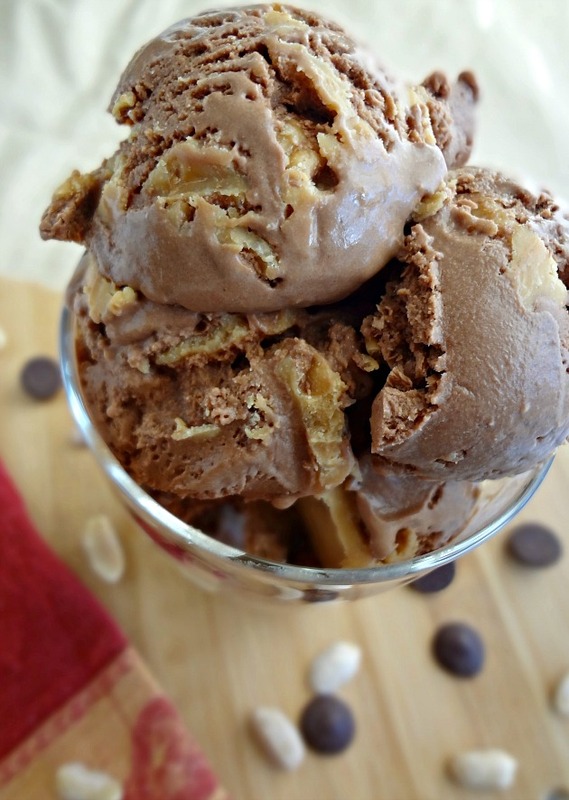 It's rich and the chocolate flavor is perfect, and there is PLENTY of salty and nutty peanut buttery goodness swirled up in there. Bonus? The recipe is super easy and egg-free. I won't say that it's healthy but...it's not as bad for you as it could be (no egg yolks mean lower fat, dark chocolate is good for you, and the peanut butter swirl is created from just mixing peanut butter and coconut oil together!) For ideal peanut buttery results...I suggest you make homemade crunchy peanut butter. It's the perfect accompaniment to the chocolate ice cream. If you like rich desserts then this is for you! It also makes the perfect amount---not so much that you can't make it all at once in your ice cream maker, but enough that you won't run out too quickly. This is definitely a winner all around! Note-the higher quality ingredients you use, the better this will taste! This is especially true for the chocolate elements--I used Ghirardelli cocoa powder and chocolate chips. Combine cocoa, water, espresso powder, and 1/2 cup sugar in a saucepan and bring to a boil. Stir to dissolve the sugar and boil for 30 seconds. Remove from heat and stir in the chocolate until melted and smooth. In a large, heatproof, bowl whisk together the chocolate mixture, cream cheese, and salt. In a small bowl, whisk together the cornstarch and 2 tbsp. of the whole milk. In a large bowl or clean sink, make an ice bath with cold water and ice. Combine the cream, corn syrup, 1/2 a cup sugar, and the remaining milk in a 4 qt. saucepan over medium heat and bring to a boil. Boil for about 4 minutes. Remove from heat and whisk in the cornstarch mixture. Return to medium heat and bring to a boil, whisking constantly, until slightly thickened (once it starts to boil it should be ready). Pour into the large bowl with the cream cheese and chocolate mixture and whisk until combined. Carefully pour into a gallon-sized zip-top freezer bag and seal. Place in the ice bath and let it sit until cold. 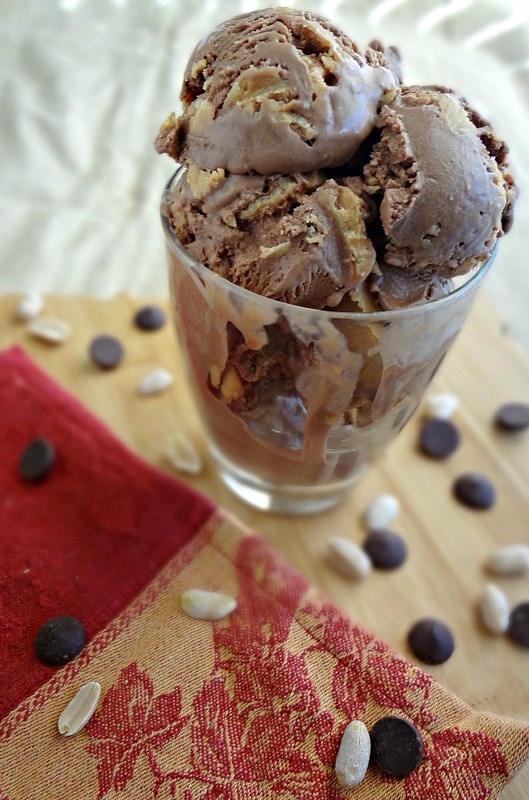 If desired, place in the refrigerator to chill for an hour-overnight--or just pour right into your ice cream maker! While the ice cream is processing, microwave the peanut butter and coconut oil together in 30 second increments, stirring after each, until melted and smooth (I only needed to do it for one burst of 30 seconds). Once the ice cream is ready, layer about a third into an airtight, freezer-safe, container. Drizzle with a third of the peanut butter mixture. Repeat until all the ice cream and peanut butter are used up--the top layer should be the peanut butter mixture. Cover and freeze well before serving (it took about 4 hours before it was ready, for me). Ohio--home of the Buckeyes. Which are made with chocolate and peanut butter.